As an electric wiring accident attorney in California, I have, unfortunately, seen my fair share of incidents causing injury and death due to electrocution, thermal burns, cardiac arrest, and other forms of muscle, nerve and tissue damage due to exposure between the human body and electricity. These incidents happen everywhere from apartment buildings in large cities like Los Angeles to farming accidents in the rural areas in the Central Valley of CA. As Californians, we should all take heed to learn the dangers of coming into contact with electrical wiring and other sources of electrical energy in an effort to prevent such incidents from injuring and killing children and adults in the Golden State. Defective Wiring: Damaged or exposed electrical wires accounts for approximately 20 percent of electrocutions every year. This can be caused by faulty installation or poor property maintenance in both commercial and residential structures including apartments, condominiums, houses, offices, hotels and retail shopping centers. These incidents also include failure to install or maintain proper Ground Fault Circuit Interrupters (GFCIs) on outlets that are near sources of water such as swimming pools, kitchens and bathrooms. 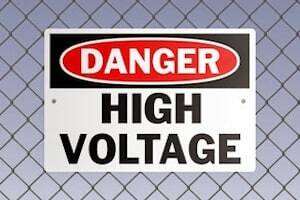 Contact With High Voltage Power Lines: Coming into contact with high volt utility lines happens frequently both above ground (e.g. ladders, roofs, “cherry pickers” and other devices such as landscaping, gardening and farming equipment being used in close proximity to power poles, transformers and wiring) and below ground (e.g. digging and striking a buried electrical transmission source). Defective Appliances and Other Products: Being shocked from contact or use of an appliance such as a refrigerator, heater, washing machine, or any type of large or small appliance with an electrical power source is a major cause of injury and death to both adults and children every year. Defective electrical heaters are a major cause of residential fires in the winter months. Sometimes electrical injury or death is the result of freak accidents that no one could have predicted. Other times, these incidents are the result of a lack of reasonable care (California legal definition of negligence) on the part of one or more individuals or entities. This could include homeowners, landlords, store owners, apartment managers, maintenance companies, utility companies, product manufacturers and many others. California tort law holds that if any such person/entity acts or fails to act in a reasonable manner and this causes injury or death, that person/entity may be held responsible for payment of medical expenses, lost wages, and emotional distress caused by their negligence. A lawyer familiar with CA negligence laws and with the ability to promptly and thoroughly investigate the cause of any electrical injury, including fires can make the difference between being able to be fully compensated for the monetary losses or having to bear this burden alone! The Steven M. Sweat, Personal Injury Lawyers, APC and the attorneys on their team have decades of experience in representing injured persons and the families of wrongful death victims in electrocution and electrical mishaps. Call our office toll free statewide at 866-966-5240 (or in the Los Angeles area at 323-944-0993) for more information.